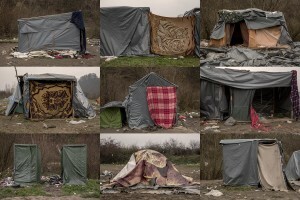 Some 2000 refugees are stuck at the border between Bosnia and Herzegovina and Croatia. 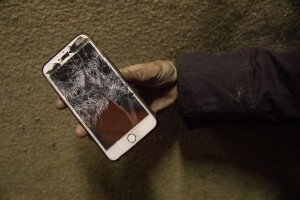 The refugees that are mostly from Pakistan are stranded in an abandoned building in the outskirts of the Bosnian city of Bihac. 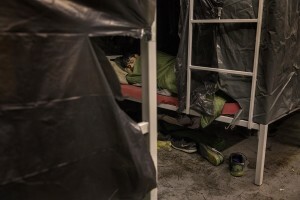 Crossing the border is impossible and many of the refugees have been beaten by Croatian police. 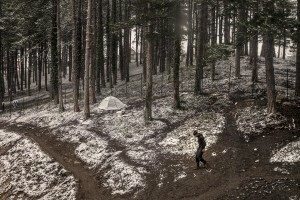 A migrant walks in a wood in the outskirts of the Bosnian city of Bihać, Bosnia and Herzegovina on November 28, 2018. 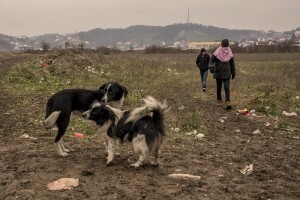 Migrant prepare food outside an abandoned building in the outskirts of the Bosnian city of Bihać, Bosnia and Herzegovina on November 28, 2018. 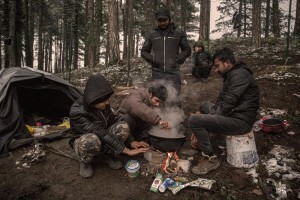 A group of migrants from Afghanistan and Pakistan gather around a fire to warm themselves in Bihać, Bosnia and Herzegovina on November 29, 2018. 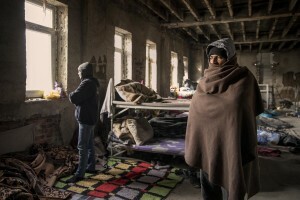 Migrants are seen inside an abandoned building where they took refuge in the outskirts of the Bosnian city of Bihać, Bosnia and Herzegovina on December 2, 2018. 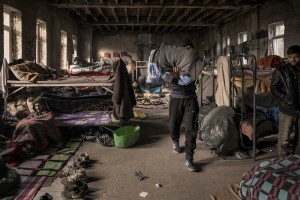 Migrants rest inside an abandoned building where they took refuge in the outskirts of the Bosnian city of Bihać, Bosnia and Herzegovina on November 28, 2018. 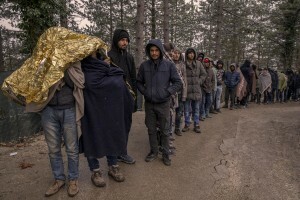 Afghans and Pakistanis migrants lined up during the food distribution near a park in Bihać, Bosnia and Herzegovina on November 28, 2018. 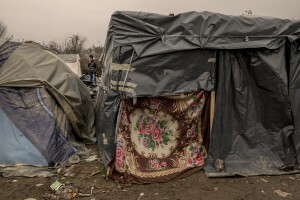 A combo of pictures shows tents inside a refugee camp in Velika Kladusa, Bosnia and Herzegovin on November 30, 2018. Migrants walk outise a refugee camp in Velika Kladusa, Bosnia and Herzegovin on November 30, 2018. 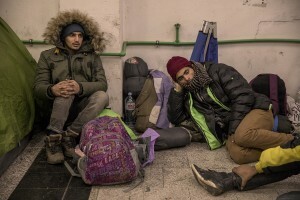 Rahin, 20 years old from Dhaka, Bangladesh is portrayed outiside a reception center in Velika Kladusa, Bosnia and Herzegovina on November 30, 2018. Chandali, 23 years old from Sialkot, Pakistan is portrayed outiside a reception center in Velika Kladusa, Bosnia and Herzegovina on November 30, 2018. 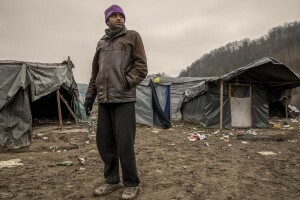 Bashir, 20 years old from Gujranwala, Pakistan is portrayed outiside a reception center in Velika Kladusa, Bosnia and Herzegovina on November 30, 2018. 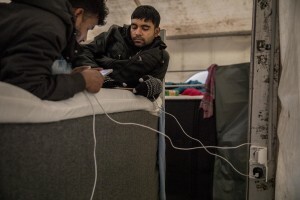 Amanullah, 23 years old from Gujrat, Pakistan is portrayed outiside a reception center in Velika Kladusa, Bosnia and Herzegovina on November 30, 2018. 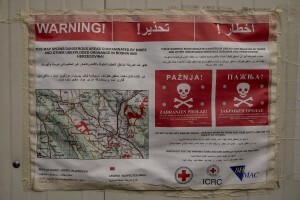 A map showing the dangerous areas contaminated by mines and other unexploded ordnance is attached on a wall of an abandoned building where migrants take refuge in the outskirts of the Bosnian city of Bihać, Bosnia and Herzegovina on November 29, 2018. 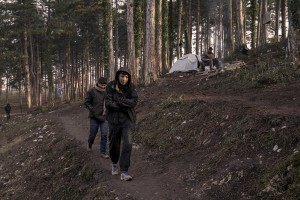 Migrants walk in a wood in the outskirts of the Bosnian city of Bihać, Bosnia and Herzegovina on December 1, 2018. An abandoned building where migrants, mostly coming from Pakistan and Afghanistan, take refuge in the outskirts of the Bosnian city of Bihac, Bosnia and Herzegovina on December 1, 2018. 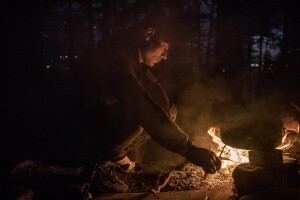 A migrant prepares food with a fire outside an abandoned building in the outskirts of the Bosnian city of Bihać, Bosnia and Herzegovina on November 28, 2018. 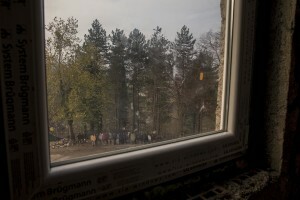 Afghans and Pakistanis migrants waiting for the food distribution near a park in Bihać, Bosnia and Herzegovina on November 28, 2018. 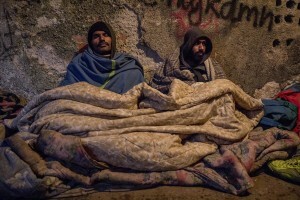 Afghans and Pakistanis migrants have a breakfast inside an abandoned building near a park in Bihać, Bosnia and Herzegovina on November 28, 2018. 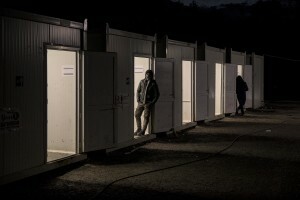 A migrant smokes a cigarette inside a refugee camp in Velika Kladusa, Bosnia and Herzegovin on November 30, 2018. 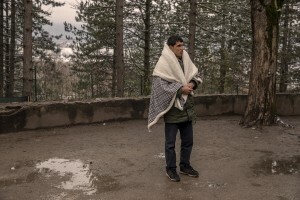 A migrant is seen inside a refugee camp in Velika Kladusa, Bosnia and Herzegovin on November 30, 2018. Migrants wash their shoes outside an abandoned building where they took refuge in the outskirts of the Bosnian city of Bihać, Bosnia and Herzegovina on November 29, 2018. 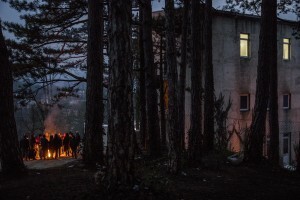 Migrants are seen outside an abandoned building where they took refuge in the outskirts of the Bosnian city of Bihać, Bosnia and Herzegovina on November 29, 2018. 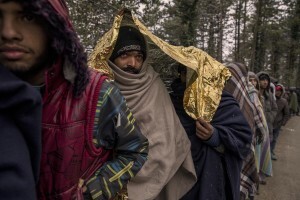 Afghans and Pakistanis migrants lined up during the food distribution near a park in Bihać, Bosnia and Herzegovina on December 2, 2018. 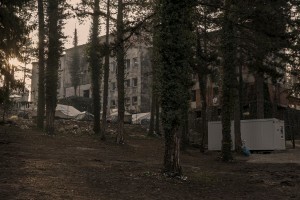 Migrants are seen outside an abandoned building in the outskirts of the Bosnian city of Bihać, Bosnia and Herzegovina on December 2, 2018. 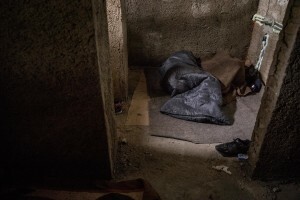 A migrant sleeps inside an abandoned building in the outskirts of the Bosnian city of Bihać, Bosnia and Herzegovina on December 1, 2018. 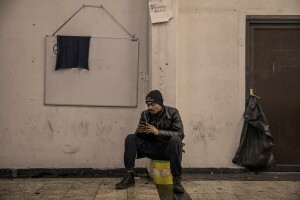 A migrant is seen inside a reception center in Velika Kladusa, Bosnia and Herzegovina on November 30, 2018. 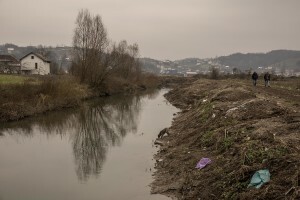 A migrant is seen in the outskirts of the Bosnian city of Bihać, Bosnia and Herzegovina on November 28, 2018. 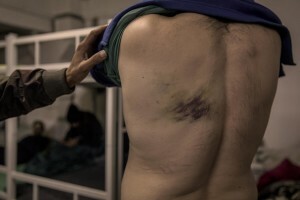 A migrant shows the wound caused by the beating by Croatian police while he was trying to cross the border between Bosnia and Croatia inside the Velika Kladusa refugee camp, in Bosnia and Herzegovina on November 30, 2018. 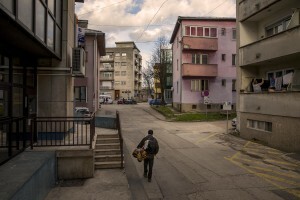 A migrant walks in the center of Bihać, Bosnia and Herzegovina on December 2, 2018.